Good price for this machine, which is a little workhorse but it pays for itself with 150 free capsules (£53.50 on Nespresso site) plus £10 Nespresso club credit. Free delivery or C&C. Thanks to @londonlad19 "Also mentions in the T&Cs for the 150 capsules that if you place an order of 100 capsules before 31st March you'll also recieve a free travel mug"
There are 2 offers depending on the type of machine you buy. This machine on hukd qualifies for offer 2 (150 capsules). I bought myself this in early Jan as my Xmas present from the Mrs! Got my capsules and it's all good. BTW Aldi do decent capsules which work out 14p each..... Not bad taste but less than half price of others. Agreed. My 5 year old one is just not making coffee hot enough anymore. …Agreed. My 5 year old one is just not making coffee hot enough anymore. Called Nespresso and they tried to move me to subscription. No thanks. Snapped this straight up instead! Bit unfair to make one of your children always make the coffee..
Temped by this and seems much simpler than going down their subscription route, thanks! Temped by this and seems much simpler than going down their subscription …Temped by this and seems much simpler than going down their subscription route, thanks! Agreed. My 5 year old one is just not making coffee hot enough anymore. Called Nespresso and they tried to move me to subscription. No thanks. Snapped this straight up instead! 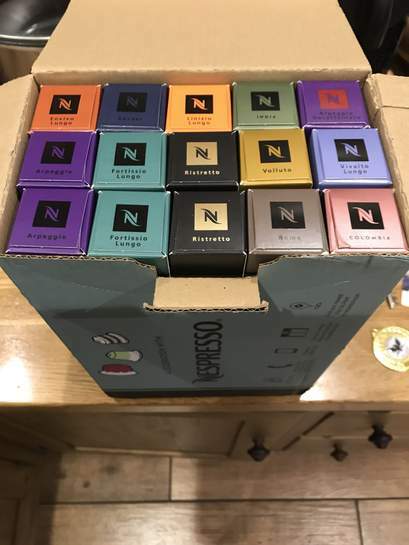 Is there a minimum nespresso order value to qualify for the 150 capsules? No I didn't order any and applied online week later got my box of 150 random coffees! Got one of these theyre good. A nice small machine,I bought one from Amazon warehouse for £40 without any capsules, don't expect the same espresso as a coffee shop but it's quite good with milk ,try L'OR capsules cheaper than Nespresso. Got one of these for Xmas. nice looking and working machine. Applied for the 150 free capsules and hey presto they all turned up today! All good. You can also get capsules from Aldi for alot less than the official ones that are compatible with the machine. Out of interest, did you try a descale? Yes. No difference. It’s also leaking, so way past its best. I picked mine up today. I've registered for the 150 free capsules (we'll see how that goes) and found a card for the £10 store credit in the box. There was also a box with a selection of 14 capsules in the box, which was unexpected. Got one of these for Xmas. nice looking and working machine. Applied for …Got one of these for Xmas. nice looking and working machine. Applied for the 150 free capsules and hey presto they all turned up today! All good. You can also get capsules from Aldi for alot less than the official ones that are compatible with the machine. What capsules do you get? Do you get to pick? No you don't pick, if you check the website there is a 150 box selection which has a variety in. Great for first timers as it gives you a chance to sample different ones. But if you already know which you prefer then it's not going to completely to your liking. Hi. Didn’t get to pick them but this is what we got. A really good selection. [Image] Hi. Didn’t get to pick them but this is what we got. A really good …[Image] Hi. Didn’t get to pick them but this is what we got. A really good selection. Offer still available folks, I think I’m going to take the plunge! Had my email Thurs 17th Jan confirming application for my 150 capsules but no sign yet. How long did everyone else's take? Having tried most of the machines out here this is definitely my favourite. Simple to use it makes small and exquisite cups of coffee. Espresso 40ml Lungo 110ml. You can program in your preferred size or as I do press Lungo button first then Espresso giving you a decent 150mls. Yes..... but they use DPD for delivery who are absolute frauds. Had my email Thurs 17th Jan confirming application for my 150 capsules …Had my email Thurs 17th Jan confirming application for my 150 capsules but no sign yet. How long did everyone else's take? Hi, Mine took a couple of weeks or so to turn up. See my pick a bit further up for what we got. Hi, Mine took a couple of weeks or so to turn up. See my pick a bit …Hi, Mine took a couple of weeks or so to turn up. See my pick a bit further up for what we got. Thanks mate. I was just worried I hadn't heard anything. Did u get an email to say they were on there way or just the email acknowledging the claim? 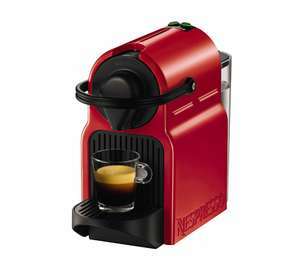 2 different companies making their own versions of nespresso capsule compatible machines. Krups and Magimix machines are made in the same factory (same address) and are identical. From what I recall these machines carry a 3 year warranty. These are usually no quibble guarantees, just keep your receipt.